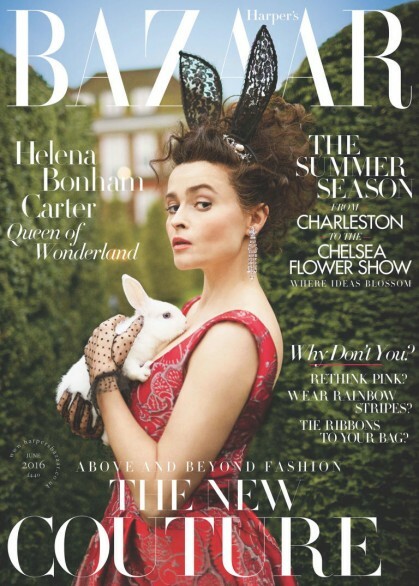 –Helena Bonham Carter on the cover of UK Harper’s Bazaar is feeding my soul today. –Johnny Depp‘s assistant (who’s still working for him) says the texts that ET posted that were allegedly between him and Amber Heard referencing past abuse were “heavily doctored.” Interesting that he didn’t just flat out say they were faked, no? I’d think it’s easier to fake a text conversation than to edit an existing one. –Ben Affleck and Jennifer Garner are in Italy together and reportedly aren’t acting very ex-like. This is really messing with my dreams for her to find a new career on a prestige cable drama in such a way that it successfully erases this relationship from our collective minds. -People is reporting that Calvin Harris dumped Taylor Swift because he was intimidated by her success. -I didn’t know Mike O’Brien was still shooting “7 Minutes in Heaven,” but there’s a new one with Sarah Silverman so yay! -The season 2 premiere of UnREAL hasn’t even aired yet, and already it’s been renewed for a third season. Luckily, critics are loving the new season. I was so worried they wouldn’t be able to keep it up. -This is an awesome video about The Wonder Years TV’s Danica McKellar and her love of math. -I’m seeing Robyn in concert this weekend. I really hope she wears this. –Jimmy Kimmel made an innocuous joke about Megan Fox‘s pregnancy and when HuffPo tried to call him out for it, he promptly told them to f*ck off. –Grant Gustin will always be The Flash to me so I’m not super looking forward to the big screen adaptation with Ezra Miller, but good on Dope director Rick Famuyiwa for landing that gig. -It’s been confirmed that Prince died of an opioid overdose. Sigh. -Well, this isn’t surprising. Hamilton’s Lin-Manuel Miranda will reportedly leave the production next month, while the original cast is jockeying for raises. -In happier Lin-Manuel Miranda news, James Corden got him to star in Carpool Karaoke. -I don’t watch The Bachelorette, but this is both diabolical and hilarious. –Michael Bay says his comments about Kate Beckinsale‘s looks were misconstrued. Uh huh. -Holy crap, does this make me happy: Brie Larson is the front-runner to play Captain Marvel. -This graph of TV ratings is nutso. Only one returning broadcast show (Law and Order: SVU) grew in ratings this year, while only three (Arrow, Carmichael Show, Chicago PD) remained steady. EVERY OTHER SHOW declined year over year. –Chelsea Handler reportedly had an exec fired from her Netflix show. –Tom Hardy says he constantly changes his number to stop hackers. Oh! That must be why he never returns my calls! -This is a juicy look at how ego, the ghosts of the Sony hack, and leaks ended in an executive being ousted. –Dave Franco and Emma Roberts get sucked into an online game in the new Nerve trailer.